At Bloomfield Dental Center, we believe in providing patients with concise, comprehensive dental care that leaves them with a smile that’s happier and healthier than ever before. Dr. Ihaab Guerguis and his dedicated staff has experienced working on dental crowns and bridges for several years.lets first talk about what is crowns and bridges. Both crowns and most bridges are fixed prosthetic devices. Unlike the removable parts as dentures which you can take out and clean daily. Crowns and bridges are cemented onto existing teeth or implants. The only way to remove it is by a dentist. The crown is a cap or covering for a damaged tooth. A crown can also be placed on top of an implant to provide a tooth-like shape and structure for function. Porcelain or ceramic crowns can be matched to the color of your natural teeth. 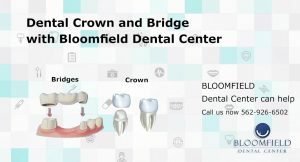 At Bloomfield Dental Center, we will advise the best option depending on the location of the crown. The dental bridges is a ceramic structure, spanning the gap left by missing or extracted tooth. The bridges may be recommended if you’re missing one or more teeth. Gaps left by missing teeth eventually casue the remaining teeth to rotate or shift into the empty spaces, resulting in a bad bite. Bridges are commonly used to replace one or more missing teeth. They span space where the teeth are missing. Bridges are cemented to the natural teeth or implants surrounding the empty space. While crowns and bridges can last a lifetime, they do sometimes come loose or fall out. The most important step you can take to ensure the longevity of your crown or bridge is to practice good oral hygiene. A bridge can lose its support if the teeth or bone holding it in place are damaged by dental disease. Keep your gums and teeth healthy by Brushing with fluoride toothpaste twice a day and flossing daily. Also see your dentist and hygienist regularly for checkups and professional cleanings. If you are not sure which one is the best solution for you. Bloomfield Dental Center will help you decide. Call us now: 562-926-6502 or contact us online to schedule your appointment.